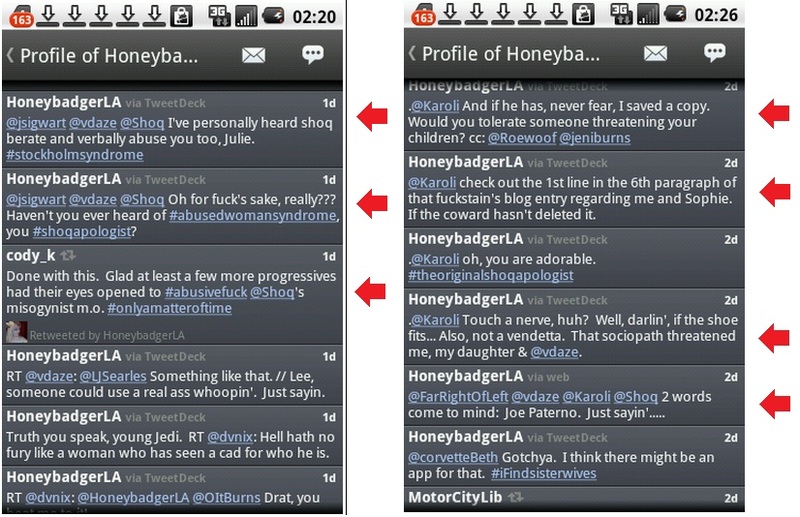 Early Wednesday morning (9/26/2012), Darshann Simon, aka @honeybadgerLA, the friend and legal associateof @angryblacklady, and brief (but obviously disastrous) romantic connection of mine, decided to blow up my telephone 15 times about 36 hours after OsborneInk's first Shoq's Twitter Brigade Burn Notice. Darshann used her home phone and cell phone to make these calls. I don't know why. Perhaps she figured one was blocked. In fact, I was just not answering her. She also left several voice mails, the longest being 48 seconds. Anything Darshann needs to say to me can be said by email. And all of this because a man she thought she fell in love with after barely 3 weeks was a bit squirmy about "treating her like a queen," rather than just treating her well. By the choices these smear-mongers have made, this entire story, and all of their roles in it will be locked in Internet amber for generations. That's a shame. But they made this choice. If they choose to retract their nasty lies one day, I might choose to remove all of this documented evidence of them. Might. I had erroneously reported there were 17 calls, when in fact, it was merely 15. Sorry! Also, I removed some extraneous verbiage from my earlier post about Darshann's family members, and those related to these other smear-mongers seeing all this someday. Obviously, they will anyway, so there's no point in wasting words saying it. Anyone who has followed this absurd and calculated drama, and this woman's daily and public role in it can only be stunned by the venality and stupifying revisionism this letter demonstrates. All I and others have done here and elsewhere has been to carefully document what she and her friends have been doing to me (and their possible motives) since August 6th, 2012 on Twitter. Notice there is no mention of my "abusing her," or "threatening her or her daughter," or any of the other massive conflagrations about Jessica (vdaze) and @angryblacklady she has been engaging in. Nothing. Nada. Zip. She tries to create the impression that she is the victim and not the victimizer, even though the evidence that contradicts that narrative is now all over Twitter and the Internet. If you search for mentions of her by me, you will find at most two instances of tweets on Twitter since August 6th. This one, and this one. Both responses to things said by she or others in her group. Everything else has been documentation of their contrived and crumbling storyline. If she, or anyone else had any evidence of "harassment of any kind by me, at any time, at any place, it has not been shown to anyone publicly, nor, to my knowledge, have any charges been filed. If anyone should be doing that, it's me (and it may come to that). The woman is simply lying on Twitter, and now lying in emails to my family. And remember, this woman is an attorney—an officer of the court. Below are just a few of her many tweets you can sample over the past month. Still not seen enough? You can see so many others by her, as well as her campaign co-horts, @vdaze and @angryblacklady, here in this document (scroll down to see more of Darshann Padilla). Posted in Shoq Value, Social Media, Uncategorized, vdaze. Since August 6th, 2012, I have been savagely attacked on Twitter by a clique of people who have lied,libeled, manipulated and concealed agendas and events in order to assassinate my character, both on twitter and in real life, mostly to cover up a very bad thing they did that compromised the #StopRush effort, and exposed personal information about its volunteers to allies of Rush Limbaugh. This clique was led by Imani Gandi (@angryblacklady), and her associates, co-bloggers and associates, including @heatherEchase Darshann Simon Padilla (@honeneybadgerLA), Jessica Delahunty (@vdaze), @miltShook, Andrew Wienick (@dvnix), @allenbrauer, @thescottfinley, @jc_christian, @theXclass, @gottaLaff, @jennjinx, @tllanes, @themanknownasX, @quadcitypat, and many others with a direct or indirect connection to Gandy and her agenda. Most of them all have different versions of this saga and their reason for being involved, because Gandy, Chase and Delahunty have told them different versions over the many months that this saga has unfolded, and more and more evidence amassed against them. Many of these same players have axes to grind with me going back many years, mostly because of an equally ridiculous whisper campaign against me conducted by a blogger named Gottalaff and her friend, a disgraced journalist named Jason Leopold and their allies. Despite their once defending me against the Gottalaff-led attacks, Gandy, Chase and Delahunty enlisted them early on in their own attack on me under the old saw that "the enemy of my enemy is my friend." While there are many documents below (and elsewhere) that describe different aspects of this drama that has plagued me and my friends since August of 2012, all you really need to read are these posts to understand most of it. How TeamUterati Founders Fell for a Right Wing Con Artist (by Osborne Ink) — the main work that explains the real motive behind most of this madness. An FAQ about the Twitter Brigade and Their Attacks On Shoq (under construction). Well, it's taken well over 6 weeks for this complete story to emerge. I am so grateful for the long hours so many have spent helping to piece together a timeline and trail of evidence spanning hundreds of people and thousands of emails, messages, and tweets. Evidence counts. As more of it mounted, people started stepping up and telling what they knew. Some perhaps, with a hope of mitigating any liabilities they may have, but others because they felt it was the right thing to do. If you've never known of this story, please read the four links (in order) immediately below. Then if you really want to know the whole grizzly backstory about how and why a "Twitter Brigade" of people smeared me viciously for 8 weeks, you'll find all the key links (in order of importance) further on down the page in the original post. Look! It’s A Bird! It’s A Plane! Oh wait… It’s Just Milt Shook (by @shoq) — This disgusting character elected to do this hit piece knowing full well he was lying and obfuscating for the others. How can you know most of what is reported here is true? By the simple fact that two key players are both attorneys, officers of the court, who know the process of discovery, the power of their own statements, and the trail of evidence that they've left behind. They know that what is reported here did in fact happen, and if you pay attention, you will not see them actually denying it. Blowing a lot of angry smoke to distract and deflect the damage it will do to their reputations, sure, but not denying it. They know that making still more false or misleading statements will only compound their problems if this goes much further. Why didn't we say all this weeks ago? Because there was no way we could tell the story without the facts, the subplots, and the compilation and distillation of the hard evidence. We all have jobs. It takes time. So I had to just eat a heaping crap sandwich every day for all these weeks, being savaged by friends and foes alike, while we methodically unraveled the real story for any thinking person to see. There is a morality tale to tell here, but I am loathe to spend any more time on this until after the November election. There is much more to say and do. And it will be said and done. If for no other reason than to restore the reputations of people who have been harmed. But it will also be to help insulate future progressive efforts against similar con men, and the stupidity that greed can bring to worthy progressive efforts when ambitious people cross over lines of decency. I will probably never get an apology from any of them, nor from many formerly mutual friends whom they misled by pretending they were motivated solely by the need to "stand up for women" and to an "abusive bully" who left an angry message on his girlfriend's answering machine last January. Am I sorry I ever had such an outburst? Of course. But reasonable people always knew it was hardly the kind of offense to justify such a massive, two month hate campaign against me enjoined by hundreds of people. Their instincts were correct. How their friends will reconcile such a vulgar deception, done for such selfish reasons is ultimately their business. I just want them to know that I don't hold grudges. Well, not for very long, anyway. We all make mistakes, and we all want to believe our friends are being decent and honorable with us. No one likes being conned or used. But it happens. Lots of stuff happens. All we can do is learn, grow, and move on. Some will also choose to forgive. That's usually been my choice. New: A chance for shoq's army of accusers to Bring Their Evidence against him! I promised friends, family, co-workers and supporters the facts about a months' long campaign to assassinate my character by a small clique with overlapping agendas. They've never had a shred of evidence beyond a single angry voice mail I left a cyber-girlfriend 8 months ago. They have kept their many relationships to, and histories with me, as well as their ulterior motives, deeply concealed below the radar of noise generated on Twitter since they kicked off their smear campaign on August 6th. No, @Shoq didn't "abuse" a bunch of women. This nonsensical gossip derives from a 3 year old, very tired narrative co-created by @gottaLaff and @nicoleSandler who have been running a vendetta against me for years (because I once hurt Gottalaff's feelings). Recently, this stupid, fact-free narrative has been given new life by @angryblacklady (ABL), @heatherEchase (HEC), @vdaze, @miltshook, @dvnix and a clique of other people with very mixed agendas, not the least of which is their own self-promotion. They rely on assist from people like @tymlee, @jennyjinx, @nadiaArtist, and @ttlanes and other @gottalaff supporters who have obessively tweeted about me for years (just search their names on Twitter). Since everyone loves gossip, these memes gain and hold traction easily. This latest chapter is all about a plan by at least two key people (and possibly more) who wanted to use all this pent up 'abuser" rhetoric to bury me with an avalanche of lies, half-truths, inuendo and gossip, hoping I would just disappear. That way, they hoped, I could never reveal certain embarassing or damaging things that I knew about them, their past, and their activities. They've assumed most are too naive, lazy or trusting to actually probe what was true and what wasn't. Now, with just a few facts shown below, their stories, narratives and agendas are melting away under a spotlight that they've brought upon themselves. As a result, people disgusted by what they are doing to me and my reputation, purely for their own self-interest, are starting to come forward and explain what they've done—and why. And they are getting very nervous. If you have supported these people in the past, I strongly urge that you stop, or you risk personal or professional embarassment later as still more facts are released. I am sorry for their board and advisory members, and other innocents who never signed-on for this drama, borne of their paranoia—and a concealed motive that will be divulged shortly. Unlike their viscious smears and Milt Shook's transparent smoke screens, accurate and responsible narratives take time. There is no shame in being conned by people you trusted. I hope those fooled by this fraud will have the courage to admit that they judged me with scant evidence, and return to my stream where we can all focus on what matters. Below are key posts I would like my friends to read, especially the one **marked**. UPDATE1: FBI to Investigate @Shoq for Breaking Up With @vdaze? Will the FBI Now Investigate @Shoq and @OsborneInk’s “Harassment” of @AngryBlackLady? Every single has a flip side by @karoli — Discussion of how enormous the bully campaign is, and its early true origins. Sometimes You @Gottalaff Until You Can's Anymore (by @shoq) — the true beginnings of the "Shoq the abuser" narratives. Always nonnsense. Shoq Value Exposed: Smear Exhibits Index — A growing list of exhibits and SAMPLES of daily attacks. Important: A chance for shoq's army of accusers to Bring Their Evidence against him! There are plenty of examples of these attacks in the Smear Index above, but a few examples are posted herein below. Thank you, to all who have believed in me and stood by me through this bizarre and destructive ordeal no matter how many bottles and bricks were thrown your way. Anyone who spoke up in my defense has been treated with a bitter ruthlessness that few have ever witnessed on Twitter. I am deeply grateful and honored to those of you who braved that onslaught, and proud to call you my friends. And a special thanks to the hard work of some bloggers and other supporters who have helped me compile the facts and tell the story. And finally, and monumental thanks to those who stood up for me despite the relentless bullying you brought upon yourselves. I am forever in your debt. I think the evidence presented above speaks for itself. Shoq — who has been had his character malciously and wilfully assassinated by a mob of cooperating band of women and men who have conducted a massive smear campaign against him all over Twitter, damaging his reputation, relationships, friendships, and business interests. Shoq's Friends and Supporters —who have been relentlessly bullied and harassed until many of them have no choice but to unfollow me (in some cases, after following me for 5 years). After they decide, they are free to follow or unfollow me as their conscience dictates. I am hoping many whose minds get changed will reach out to some of the hundreds of other people who were poisoned by this coordinated yarn spinning, and ask them to follow me again so we can all use Twitter for more productive things. I had been hoping this drama would have ended over 2 months ago when it started, but that wasn't in my attacker's plans. What was postured as an organic "speaking out" by a an "abuse victim," was actually anything but that. Most have seen me trying to keep this all off Twitter, while oblivious to how much the real attackers only pretended to (we rarely see who we don't follow). I am hoping the documents above will change that perception. As long as these attacks continue, will we debunk them and the people behind them. And with a lot more detail than they will be comfortable with. What gets addressed to specific names, e.g. "@barackObama — @shoq is a vicious bully and should be fired as a supporter. http://j.mp/somelink"
Such addressees can get messages about me all day long but unless you follow them, you will never see them. This is a favorite tactic of these Twitter bullies. Protected Tweets — When bullies protect their timeline so only their followers can see their tweets (and they don't show up in searches). Another popular tactic. Direct Messages — sent to hundreds of people every day, to anyone they can get to follow them so they can direct them to one attack website or another. Phone calls — between the core group coordinated this campaign, but which are obvious, or indicated or reported in various ways. I've had a few notable lapses since I promised to exit all this, but mostly I have tried to keep my word and focus on this election. Please stand-down and try not to comment and appear aligned with these people because you really have no concept of what has really transpired and look ridiculous to those of us who do. Moreover, you will be connected with their smear, which may have unintended consequences as the names of anyone that does becomes set in Internet concrete for eternity. The complete list will be continually updated on the Shoqvalueexposed: Smear Exhibits Page. Searching a site like topsy.com for any of these names and "@Shoq or @vdaze" will show you just how active all of these accounts have been during this epic smear campaign. When these people speak to you, please know their agenda concerning me. @vdaze’s “Dysfunctional C**t” Tweets — the first “meltdown” of August 6th, 2012, hours after an email exhange with shoq (vacationing in Canada at the time) discussing how they could fix their relationship. Shoq heard about a rant, but never actually saw the tweets until weeks later. @vdaze Retweeted — While she protects her Twitter stream, she cannot prevent (nor did she really want to) a huge number of her tweets escaping into the wild. These represent only a small percentage of what her private feed had actually been seeing on a daily basis week after week after week. #AbusiveFuck Tweets — (18 pages of them) — wherein key players engage in repetitive hashtag attacks for days. @AngryBlackLady Tweets Mentioning Shoq — over 6 week period. All parties involved have deleted many tweets, but they are captured in various forms. Posted in Explainers & Primers, Politics, Shoq Value, Uncategorized, vdaze.